Farmersgirl Kitchen: Haddock Mornay Layer Bake - keen as mustard! All of this little lot came to me from Kelly Atkins at Food Matters. They are working with Henry Harris and Grey Poupon to show the versatility of Grey Poupon Dijon mustard as an ingredient in cooking. 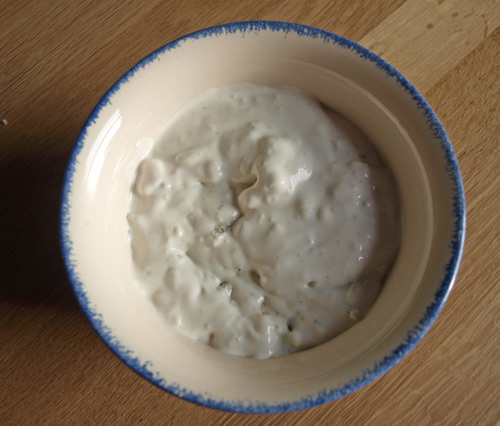 Grey Poupon is one of the finest Dijon mustards, it’s the white wine in the ingredients that makes it superior to its competitors and the flavour it creates when used as an ingredient is very unique. 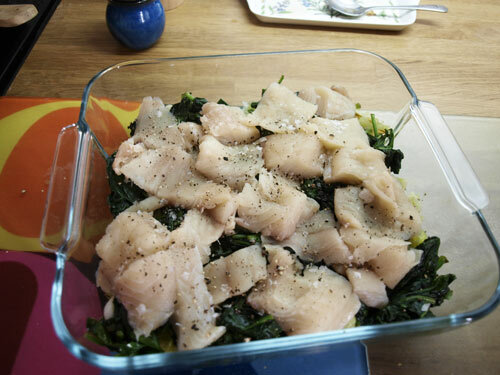 I opted to make a fish dish and only specified some spinach, the rest of the ingredients were a surprise to me a bit like doing 'Ready Steady Cook'! After much thought and some inspiration hunting through my cookbooks, I decided to make a layered bake. Put 1 tbsp olive oil and 15g butter in a large pan, add the leeks when the butter begins to sizzle. 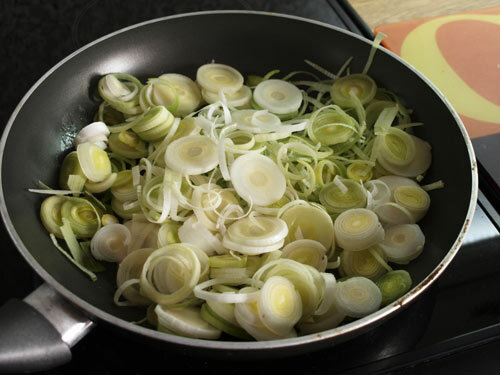 Saute the leeks gently until they are soft and slightly golden. Tranfer them to an ovenproof baking dish, season with salt and pepper. Put the other 1tbsp of olive oil and 15g butter into the pan and add the whole bag of spinach leaves once the butter begins to sizzle. 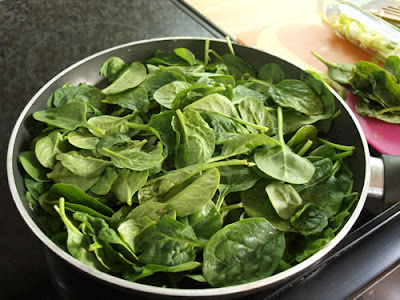 Cover the pan (I used a sheet of foil and cook gently until the spinach has wilted, about 5 minutes. 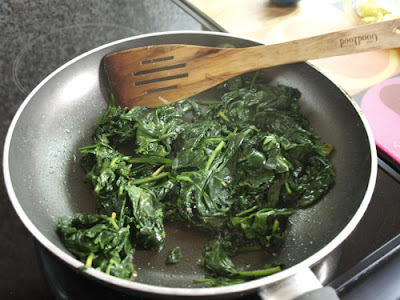 Place the wilted spinach over the leeks in the ovenproof dish, season with salt and pepper. If the fish has skin, remove the skin and cut the fish fillets into chunks and spread over the spinach and leeks. Season with salt and pepper. Put a tsp of cornflour into a bowl and add about a tbsp cold milk, mix together. The cornflour will help the creme fraiche not to split when the dish is baked. 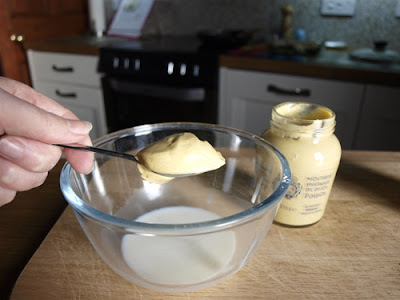 and now for the mustard, add a generous teaspoonful of Grey Poupon Dijon Mustard to the milk and cornflour and mix thoroughly. 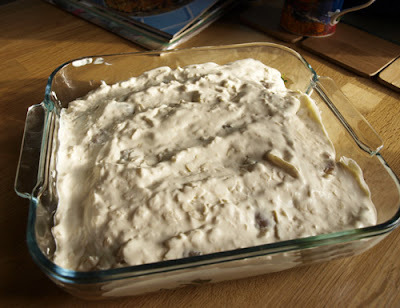 Add the Creme Fraiche and the two chesses and mix together. Spread the mixture over the fish and vegetables layers. Peel the potatoes and slice thinly, parboil in a pan of boiling water for about 5-10 minutes until soft but not breaking up. 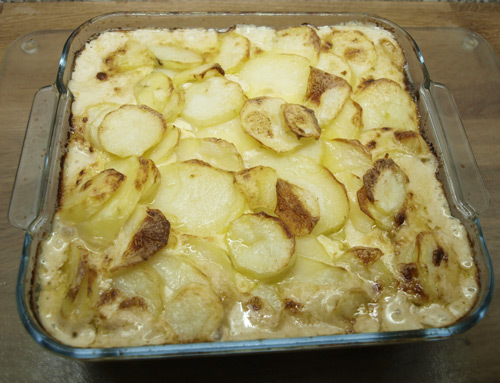 Top the ovenproof dish with the potatoes. Melt around 20g of butter in a pan and brush the potato slices with the melted butter. Bake in the oven at 180C for 30 minutes until the sauce is hot and bubbling and the potatoes are golden brown. 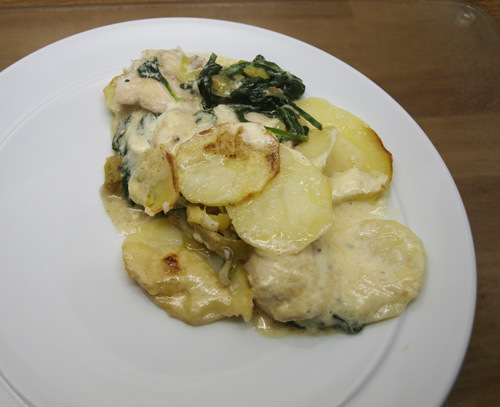 I was really pleased with the taste of this dish, you could taste all the ingredients but no one overpowered the others and the crispy texture of the potatoes was a nice contrast to the creamy sauce and soft vegetables. Now the eagle-eyed among you may have noticed that I did not use the Stilton. I felt that it would have overpowered the taste of fish and I wanted the mustard to be the dominant flavour. However, I thought it might be nice to accompany the Fish Bake with a salad and a little Blue Cheese Dressing. 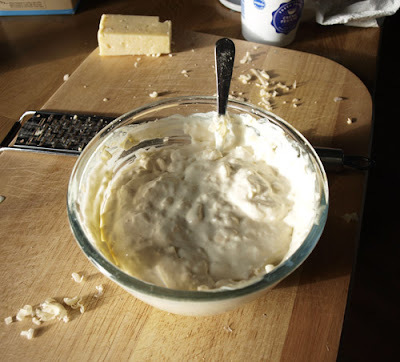 Crumble the blue cheese, set aside about 1/3 of the cheese and mix the rest with the cream cheese until well blended. 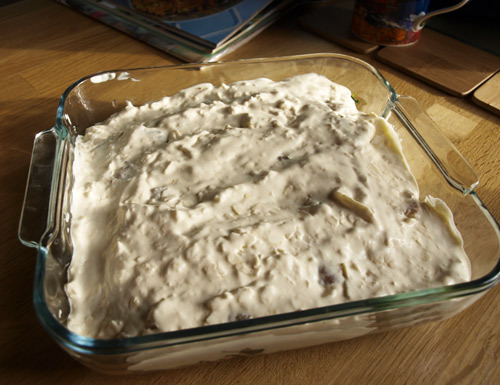 Stir in the mayonnaise and the single cream, then stir in the remaining blue cheese. 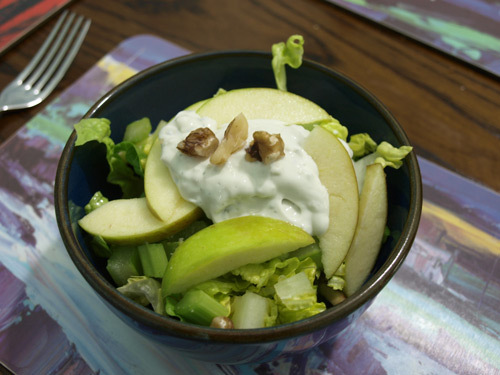 I made a simple Waldorf salad with Romaine lettuce, chopped celery, sliced apple and chopped walnuts, combined with the Blue Cheese dressing this was very good and a complete contrast to the fish bake. Looks really nice Janice could just eat the mornay, love fish. It looks wonderful Janice, just my kind of meal too....LOVE Grey Poupon mustard too. Janice, that looks really good! I think I'd really enjoy it! Absolutely love Mornay and this looks great. Must make one again! Firstly, what a lovely dish! 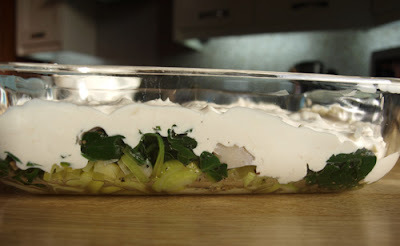 I love the idea of a layered fish bake. Mouth watering as I type. Secondly, what a brilliant challenge to receive those items. Love it! I love the look of that layer bake - I'm not a fan of blue cheese though so I'm glad it went on the salad instead. Maybe I could use up my last remaining leek in something like this! I love the idea of your delicious fish bake and think you have made something I would absolutely love to eat. I am all for the Dijon mustard, my favourite! Love that combination of flavours. Great winter dish. Mmm I love dijon mustard and never thought of using it like this. I reckon my son would enjoy this. Great idea! 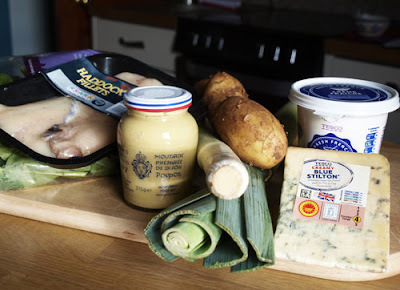 A good savoury and well thought out recipe, wise to leave out the blue cheese as it would have overpowered everything. 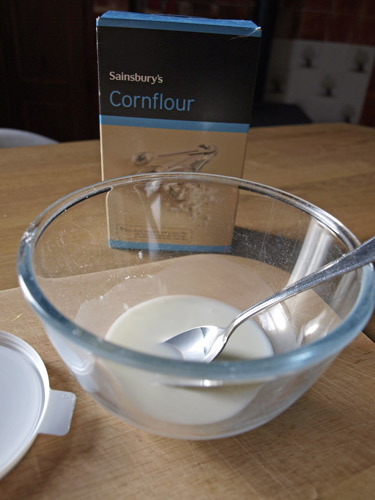 great tip on the cornflour! I learn something new everytime (: and really love layered bakes of all sorts, that looks real fab! This looks so good. It might be a good dish to introduce fish to a 'fish hater'...I know one of those and have been trying to find something for ages that would be a good introduction! This looks really good. I keep meaning to cook more fish, as we don't eat enough, but can never think of what to do. Shall bookmark this!